Der Artikel John Williams (geb. 1932): Filmmusik: Witches Of Eastwick wurde in den Warenkorb gelegt. 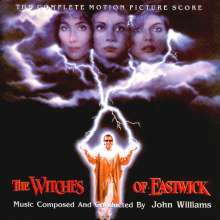 Perseverance Records is proud to announce the reissue of the soundtrack to Witches Of Eastwick by the legendary John Williams. If you could compare a film composer to a rock star, John Williams is our genre's equivalent to the Beatles. He's the biggest selling, most recognized composer of all time. It is rare if you can't find somebody who hasn't heard or loved his music. Williams' music has touched so many people in the form of Star Wars, Jaws, E. T., Raiders Of The Lost Ark, Dracula, Home Alone, Jurassic Park, Catch Me If You Can, Harry Potter and so many more. With Witches Of Eastwick he created a change of pace from what he became known for. It was a playful, wonderful and brilliant score for a comedy film. When you watch the film, even Jack Nicholson whistles his own theme! The score was nominated for an Academy Award. If you missed out on the Collector's Choice reissue from a few years back, we are offering it with new artwork and remastered sound. Release Notes: »As with all of our Warner reissues, they handed us a quality master. It does not have that error the Collector's Choice reissue was plagued with.« Liner notes by Randall Larson. »This is a straight reissue using the track listing from the original LP and Collectors Choice reissue. As usual, we want these to be reasonably priced for collectors who missed out as well as the non-collector who saw the movie and loved the music. There will only be 3, 000 copies manufactured. We will not make any more after we reach that total.« We used the movie key art and updated the CCR art. In our opinion, this is a much better looking package that uses photos from the movie (licensed from WB). Hörprobe Track 9: Have Another Cherry!